This week please read sections 4 - 6 of chapter 8 (pg. 242 - 268) and listen to Op. 132 repeatedly. Please comment on this week’s reading/listening and continue to comment on previous weeks’ readings/quartets. I hope all goes well. Tom suggested we all name our favorite Beethoven pieces. I would choose the Ninth Symphony, the Missa Solemnis, the last four piano sonatas (op. 106, 109, 110, and 111), and the late quartets. This week’s quartet features the famous Heiliger Dankesang. Beethoven wrote this in the Lydian mode. 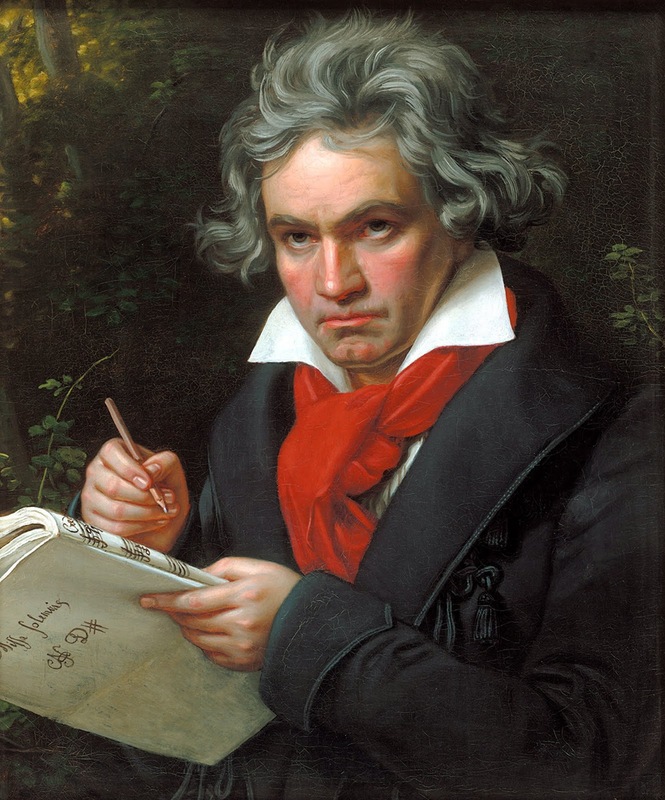 Almost all music composed during Beethoven’s lifetime fell into either a major or minor key. This proved true of almost all music during the Common Practice Period, the period in classical music from the early seventeenth century until the late nineteenth century. In the late nineteenth century composers after Wagner such as Mahler, Debussy, Strauss, and Scriabin started pushing tonality to the breaking point. Before the Common Practice Period composers often used other modes besides the major and minor. If you play all the white notes from C to C on a piano, you get a major scale. If you play all the white notes from A to A, you get a natural minor scale. If you play all the white notes from D to D, you get the Dorian mode, from E to E the Phrygian, from F to F the Lydian, and from G to G the Mixolydian. Medieval and Renaissance music used those latter four modes. Beethoven decided to go back to the day before yesterday to compose the third movement of Op. 132 and used the Lydian mode. (Miles Davis and Gil Evans used these modes in jazz in the 1950’s). In the strange but true category: The client I began working with yesterday, Ludi Hinrichs, revealed his full name to me for the first time - Ludwig Van Beethoven Hinrichs. His father named him after Beethoven. Other than these Quartets, the only Beethoven I've listened to are the Symphonies. The Ninth is my favorite. When I read Eric's entry, I realized that the Missa Solemnis was a big gap in my Beethoven collection, so I downloaded it. Being in this reading group also got me to assemble a complete collection of the string quartets. Oz, wait till you hear the piano music! Last week’s Quartet, op. 127 goes along with the mood and epic event of the Democrats taking the majority in the House. I imagine the music of op. 132 expressing the collective mood of the new House, filled with more women and greater diversity than ever, establishing an agenda. Well, I hope they govern with the warmth, beauty and sudden decisiveness of this Quartet. The first few sentences on p.242 with the castle in the clouds metaphor read as brilliant and right on. “The main theme, of course, remains in a spiritual transformation.” – roadmaps to the Soul, as Dylan says. For moi, this connects with the “sense of coherence” Kerman writes about and that I commented on last week. I wonder if Kerman intends humor and irony? On p. 242, right before the break, he writes about the A flat “as the final irreducible essence” in the end of op. 127. In the very next sentence, with a double negative, he asserts the possible interpretation of reducing the A flat to a “tendency-note.” Perhaps breaking free from irreducible Aristotelian essences indicates some of the spiritual transformation our beloved Author went through listening and writing about Beethoven? Greetings everyone. It has been a while since I've posted any comments as I am just now catching back up! As far as my favorite Beethoven pieces go, so far I am quite fond of the piano sonatas and haven't quite picked a favorite Quartet yet. I still have some listening to do. I am off to do some mushroom sterile work and listen to OP.132. Cheers all! I loved the Horenstein recording of the Missa. More on Communism, the Beatles and Illuminatus! A business book by RAW fans? Cosmic Trigger II coming soon! Hail Eris! All Hail the Saucers!